Students that may feel intimidated by the thought of creating a self portrait may enjoy this lesson. Instead of drawing themselves in a representational manner, students draw objects that represent them and put them together so that they resemble a face or figure. This lesson is appropriate for students of level one high school or for middle school students. Overview and Purpose: This project will allow the student to become familiar with the art classroom environment. It will allow the student to look at self portraiture in a new way and provide for an interesting outlet for self expression. Delivery of Info: Students will be asked what is a self portrait? 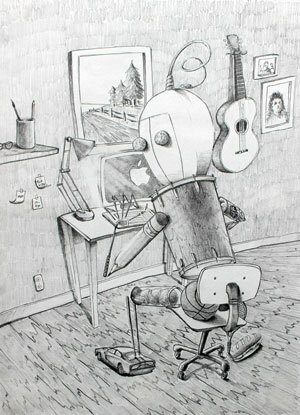 The teacher will lead in a discussion of how self portraits are images of artist that they create themselves. The teacher will also point out that at times symbols can be used to create meaning in an image. Students will then be asked to think of objects that might be seen as a symbol of part of their personality, for example, a paintbrush for someone who likes to make artwork. The students will then be told that they are to create a self portrait using only symbols or objects that represent them. This is a non-traditional self portrait. The teacher will show examples and have students discuss if these examples are successful or not and why they are or aren’t. Guided Practice: The students will spent the next four class periods creating the artwork. The teacher will monitor student work and come around to help students with their work. Review: Daily during the course of the project, the teacher will remind students of the goals of the project and encourage students to evaluate their own work as the project continues.